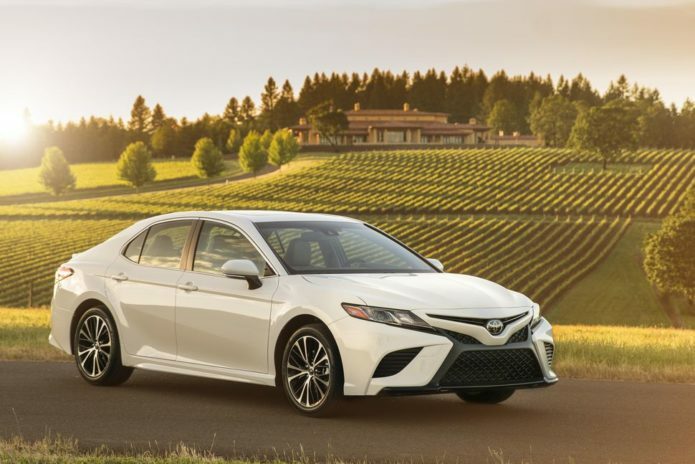 THE GOOD: The 2018 Toyota Camry Hybrid manages mid-40s fuel economy, yet still feels powerful on the pedal. Premium looks inside and out, along with comfortably solid driving characteristics make it a very livable car. Toyota includes automatic emergency braking with pedestrian detection standard. THE BAD: The all new Entune 3.0 system in the Camry Hybrid lacks support for Android Auto and Apple CarPlay. The engine sounds rough when accelerating, and adaptive cruise control doesn’t work under 32 mph. 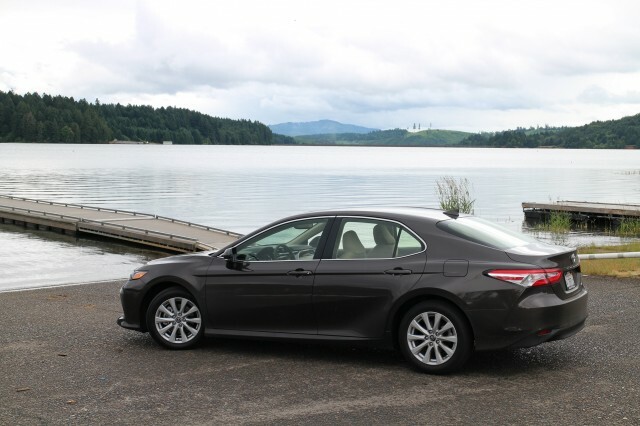 THE BOTTOM LINE: The 2018 Toyota Camry sets a new standard for midsize sedans in style and driving feel, capping it all off with standard advanced safety technology and incredible fuel economy, but its Entune 3.0 infotainment system suffers from deficiencies compared to the competition. Glittery, bright red paint in what Toyota calls Ruby Flare Pearl and with more contour lines than WTF moments in “Game of Thrones,” the 2018 Camry Hybrid stunned me with its visual presence. From the belt-line dip at the cab to the odd little C-pillar crease, Toyota’s designers express a lot of feeling in this new Camry. I almost expected a Lexus badge up front, rather than the upended-oval-and-steer-horns Toyota emblem. And beyond style, the new Camry looks big, not terribly surprising as it gains a couple of inches in wheelbase and about 1 inch in overall length versus the previous generation. Although wider by a half-inch, it also drops an inch in height, which likely explains the nearly 3-cubic-foot drop in passenger volume. That said, the interior felt roomy in both front and rear seats. The Camry, Toyota’s midsize sedan, gained a reputation as a boring transportation appliance, yet still manages to hold the top spot in US car sales for many years running. At this year’s Detroit auto show last January, Toyota introduced its completely re-engineered and restyled 2018 Camry. This eighth-generation Camry sedan is built on Toyota’s new architecture, which also underpins the new Prius. The company sells it with a four-cylinder engine, V6 or as a gasoline-electric hybrid, similar to the previous generation. Toyota offers the Camry Hybrid in LE, XLE and SE trim, of which I drove a preproduction version of the last of these. For 2018, Toyota increased the output of the car’s 2.5-liter four-cylinder engine, from 156 to 176 horsepower, while reducing the complementary electric motor from 105 to 88 kilowatts. Those changes result in a higher overall output, going from 200 to 208 horsepower. Along with more power, the new Camry Hybrid boasts an increase in fuel economy. In SE and XLE trim, the 2018 Camry Hybrid gets 44 mpg city and 47 mpg highway, about 8 mpg better than the 2017 model, on average. My results came in at 44.5 mpg for the Camry Hybrid SE. As an added wrinkle, Toyota also makes the Camry Hybrid LE available, using a lithium-ion battery pack instead of the nickel-metal hydride used by the other trims, and achieving an impressive 51 mpg city and 53 mpg highway. With the key fob in my pocket, the Camry Hybrid unlocks with a touch of the door handle, and pushing the start button causes the silent boot-up I’ve grown accustomed to with hybrids. Starting out my journey with the drive mode set to Eco, rather than Normal or Sport, I notice that the mode also affects climate control, not just the powertrain. Eco modes have become popular in cars, but few actually detune the air conditioning, one of the prime accessory energy users, so it is good to see Toyota implement it here. The car flows through the parking lot under electric power, the power animation on the center 8-inch touchscreen showing the battery feeding the drive motor. On the street, stepping into the accelerator a little more, the engine cranks up with a noticeable harshness, its grinding noise disrupting the electric quiet. The engine sound isn’t great, but I only hear it under acceleration. And Toyota’s planetary gearset, which stands in for a traditional transmission in its hybrids, seamlessly mixes the power, so I don’t feel an unexpected boost from the engine. When I find a need to slow, especially going down a hill, I ride the brakes in the knowledge that, rather than burning up brake pads I’m charging up the Camry Hybrid’s battery. Over rough roads and smooth, the Camry Hybrid delivers a firm but pliant ride, handling potholes and bumps like a professional. The whole experience, from the heft of the steering to body motion, feels solid and well-tuned. Although the climate control’s Eco mode keeps me nice and cool while driving in 90-degree heat, I try out the Camry Hybrid’s Normal drive mode. It gives a little more throttle sensitivity, but not enough difference for me to use it on a regular basis. If I owned the Camry Hybrid, I would likely just leave the car in Eco as my default. I wait until I get the Camry Hybrid on a twisty mountain road before hitting its Sport mode and using the steering-wheel-mounted paddles. This mode seems completely unnecessary for the Camry Hybrid, but it firms up the steering and makes the throttle more sensitive. Sport mode puts the transmission in S4, which is really more of a range than a gear. Dropping it down to S3 with the paddle, I hear the engine running at higher speed, although there is no tachometer to track the rpms. 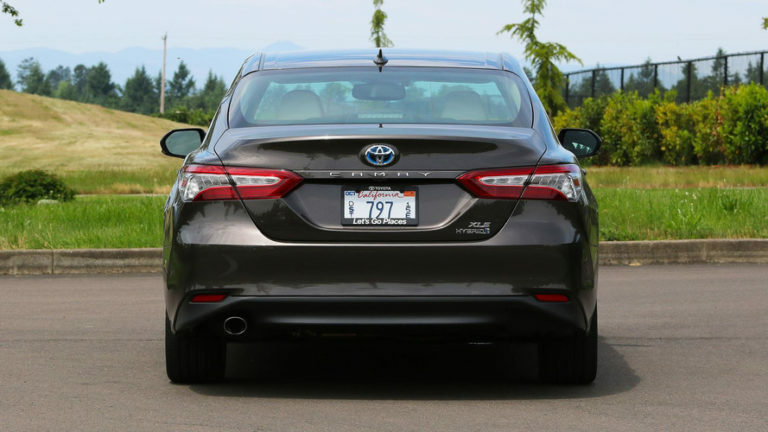 The firm suspension limits body roll in the turns, but understeer and length keeps the Camry Hybrid from being a sleeper sports car. More than the drive experience, and killer fuel economy, what I really looked forward to in driving the new Camry Hybrid was the chance to experience Entune 3.0, the first production infotainment system to be built on Automotive Grade Linux. For Entune, it’s like the change from Mac OS 9 to OS X, a completely new system built on a well-engineered platform. The home screen shows audio on the right side of the dashboard touchscreen, with the car’s power flow animation on the upper left and saved phone contacts on the lower left. Audio includes the usual sources, from a single USB up front to Bluetooth streaming to satellite radio. The interface graphics look practical, without much effort spent on aesthetics, and the touchscreen proves responsive. Navigation in this preproduction Camry Hybrid SE, however, is relegated to Toyota’s Entune 3.0 App Suite, powered by Scout GPS Link app running on my phone. A Toyota spokesman told me that onboard navigation will be available in production versions of the Camry Hybrid. After setting up my Entune 3.0 account, setting up another one for Scout GPS Link, then connecting my phone to the car, I’ve got maps on the dashboard. I can look up destinations in the Scout app on my phone and have them available in the car, or in the car I can use the 8-inch touchscreen to type in an online destination search. However, Entune locks out most inputs when I’m moving, so I can only search when I’ve pulled over and put the Camry Hybrid in Park. The maps are easy to read, and route guidance works accurately. However, Scout attempts to get granular by telling me the next turn is coming up in distances as short as 50 feet. Phone GPS isn’t all that accurate, so I often found myself already making the turn when Scout advised me about my upcoming maneuver. Increments of 100 or 200 feet would be more practical. Oddly, the Scout navigation implementation in the Camry Hybrid also switched inexplicably between the map view and turn list when under route guidance, with no apparent means of selecting one or the other. While testing Entune 3.0, I frequently thought to myself, why didn’t Toyota just go with Android Auto and Apple CarPlay? The best response I could suss out was Entune’s much greater number of third party apps, an area where both Apple and Google have been surprisingly slow to implement. Just as in the previous version of Entune, I could listen to NPR One, iHeartRadio, Slacker or Pandora, and I could search for destinations on Yelp. Of course, there’s no reason Toyota couldn’t include Android Auto and Apple CarPlaysupport alongside Entune 3.0 in an update. My biggest complaint with Entune 3.0 in the Camry Hybrid was that it not only locks out destination entry while underway, it also doesn’t let me select music from my iPhone library. Instead of choosing an artist or album, selecting my iPhone as the audio source merely auto-played the top listing in the library. That’s more restrictive than any car on the road, but hopefully something that will change for the production vehicle. Last year Toyota made a commitment to include advanced safety technology on all its cars, standard, which means the Camry Hybrid benefits from the Toyota Safety Sense P bundle of features. Although I didn’t test it, the car detects pedestrians and automatically brakes if it senses an impending collision, a potentially life-saving technology. The bundle includes lane-departure prevention, which steers the car back into its lane if you let it drift. However, this system is the least aggressive of the many I’ve tested, as it only took hold when I was well onto a lane line. On the convenience front, the Camry Hybrid includes adaptive cruise control, which matches speed with slower traffic ahead. This system worked well on the freeway, but as it braked for stopped traffic the system dropped out, displaying a message that it doesn’t operate under 32 mph, making it useless for stop-and-go traffic. Certainly in its styling, Toyota keeps the 2018 Camry modern. And its roomy, near-premium interior will appeal to many a dealer lot shopper. The Camry’s engine line-up looks staid compared to competitors, who mostly ditch V6es in favor of turbocharged inline fours. However, with the Camry Hybrid you can’t deny the the double-win of improved power and fuel efficiency. 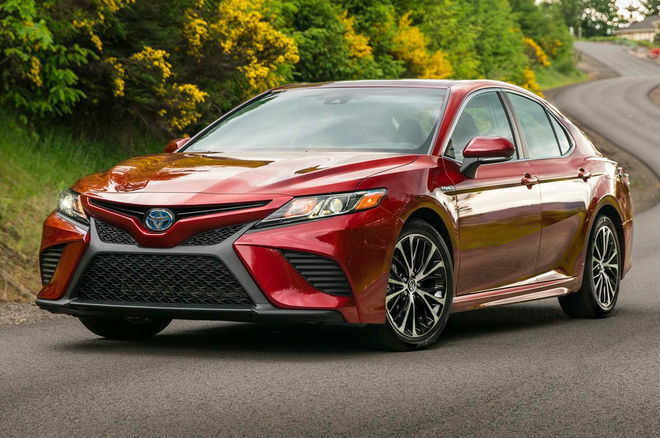 As with the past Camry generation, I favor the hybrid for its combination of power and economy, despite the fact the new four-cylinder Camry gets just over 200 horsepower. Entune 3.0 prompts the question of why Toyota hasn’t implemented Android Auto or Apple CarPlay, although they aren’t mutually exclusive. Maybe in a future version. Surprisingly, the least expensive Camry Hybrid, the LE at $27,800, gets the best mileage, topping 50 mpg due to its lithium-ion battery and improved powertrain efficiency. That makes it a tempting option, but I would take a serious look at the Camry Hybrid XLE. At $32,250 base, the XLE trim comes with many interesting standard features, most prominently a 10-inch head-up display and a more upscale audio system. For the gadget-happy, the XLE is the way to go. 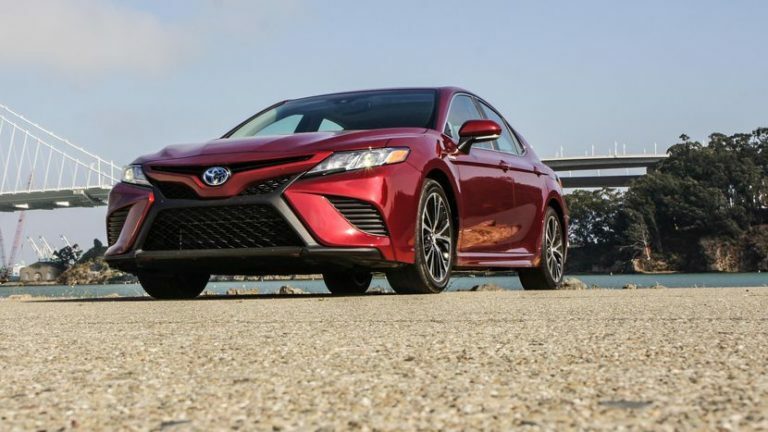 The midsize sedan segment, where the Camry competes, has long been hot, but this new generation comes out at a very strategic time. Chevrolet showed off a well-received new generation of its Malibu two years ago, while Honda has announced its new generation 2018 Accord, which won’t hit dealers until later this year. The Hyundai Sonata gets a major facelift for the 2018 model year and will be out soon. Other competitors, such as Ford Fusion and Nissan Altima, are long in the tooth. 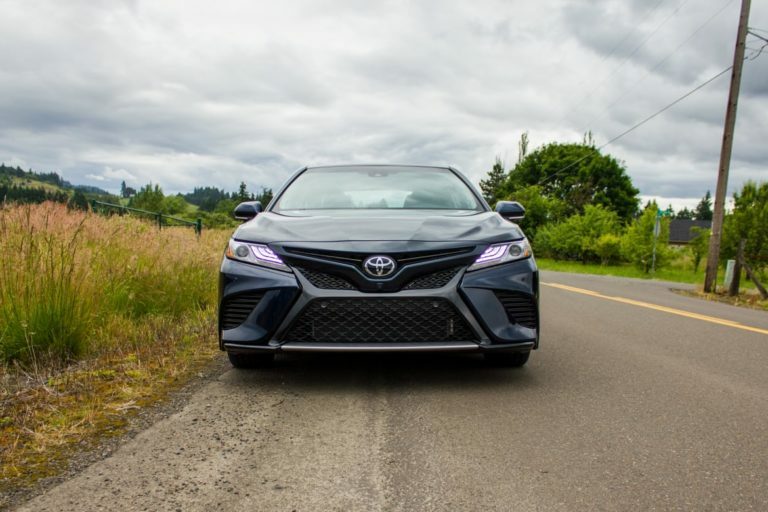 Editor’s note: This review was based on a preproduction version of the 2018 Toyota Camry Hybrid SE. Although we don’t expect our evaluation of ride quality or design to change, Toyota may revise software with the its infotainment system.